With each year that passes by, my appreciation for quality cocktails only grows fonder. In a transient city that’s constantly evolving, there’s no shortage of innovative cocktail programs. 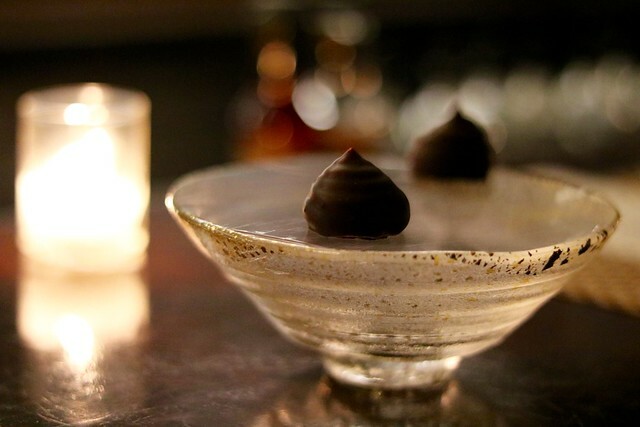 As we’ve been loving creating this Thirsty Thursday column, we knew a visit to the multiple James Beard Award-nominated Columbia Room was only appropriate. Columbia Room was created by a leading spirits and cocktail expert, Derek Brown. Brown not only owns the highly-acclaimed establishment, but also serves as President of Drink Company. His entity, Drink Company also boasts a trio of bars, Eat the Rich, Southern Efficiency, and Mockingbird Hill. Most recently, Brown transformed these craft cocktail bars into exceedingly successful seasonal concepts for pop-up bars. 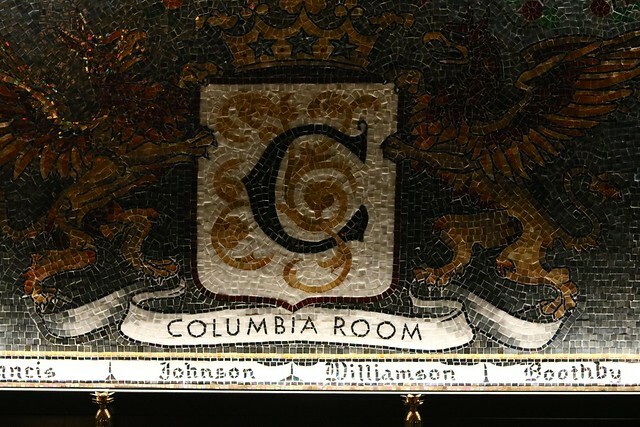 Previously, the Columbia Room was simply a special room within the old location of the Passenger spanning just 10 seats for those lucky enough to step inside. The new Columbia Room is a three-part concept tucked away in bustling Shaw, and reopened last February in Blagden Alley sans any signage. Columbia Room consists of three distinct spaces: a punch garden on the outside roof deck, a cozy spirits library inside, and the tasting room, hidden behind a black curtain in the back. We spent our evening inside of the dimly lit tasting room. An exquisite mosaic, made up of hand-cut Italian tiles welcomes you into the private room. The names across the bottom of the mural pay homage to alchemists and bartenders from the 19th century that have made notable contributions to the world of spirits. Many of the seasonal plants and herbs shown on the mural—such as saffron— are present in the cocktails crafted at the Columbia Room. The mosaic sits behind a dark oak bar that arches across the room. The tasting room holds a sense of mystery and prestige. Hidden booths lie beneath the velvet curtain for an even more intimate experience. My dear friend and whiskey aficionado, Jen joined me for an eventful evening to preview cocktails. We noticed a handful of dates and small groups of friends in the spirits library on our way into the tasting room. The tasting room spans 14 seats along the bar with private booths also available. It was predominantly filled with quiet couples celebrating momentous occasions. Jen and I felt seemingly out of place but didn’t mind too much. The tasting room requires pre-paid reservations for the three or five course pairing menu, perfect for date nights or a special occasion. The punch garden is more relaxed and suitable for larger groups to enjoy cocktails outdoors. Depending on your personal preference or what’s in your wallet, a number of experiences are available in the Tasting Room, which is reservation only. We opted to try the five-course tasting menu, priced at $108 (including gratuity) instead of ordering drinks a la carte in the spirits library or punch garden. Pre-fixe menus are available and change seasonally. On our visit, we went with the menu proudly titled “Women Rule” which honors notable women in the hospitality industry. Jen and I began with a Petit Sazerac for an amuse. The Sazerac was first created in New Orleans, originating in a coffee house. 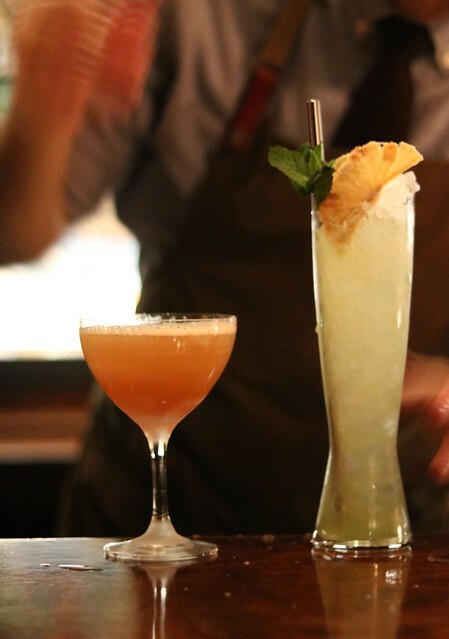 Bartender Alex Levy walked us through each of the innovative concoctions as he prepared them along with the bite-sized pairings by Head Chef Johnny Spero. The Petit Sazerac was served in a glass washed with a splash of absinthe. This cocktail amuse was essentially a mixture of an old fashioned with rye whiskey and simple syrup. We were impressed for what else was in store. The first course began with a gin and vermouth cocktail, amusingly titled the Hanky Panky. The Hanky Panky is the brainchild of Ada Coleman, as she developed it at the Savoy Hotel in London. Coleman served famous folks like Charlie Chaplin, Mark Twain, and various aristocratic creatives. Her ability to be hospitable made her exceptionally notable. It’s a no-brainer Coleman’s creation would be included on a menu honoring fierce females. The cocktail was aromatic to say the least with amaro bitters and notes of mint and licorice. The cocktail is usually paired with a pickled anchovy with black olive and Guindilla peppers. Due to my dietary restrictions as a vegetarian, we had another item prepared for us that was inspired by flavors often found across regions of Spain. The second course is a palette cleanser, an earl grey Marteani inspired by Audrey Saunders. Saunders is dubbed the Libation Goddess, and helped jump-start the booming cocktail industry when she opened up the Pegu Club in New York City in 2005. 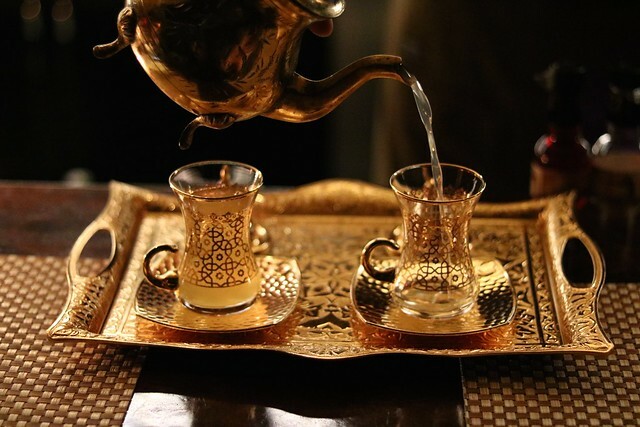 This warm golden cocktail is served in a stunning brass tea cup. To make the beverage, gin and sour whey are infused with earl grey tea and batched with buttermilk to provide some acidity. I especially enjoyed this cocktail, which was a soothing beverage for a cold winter night. 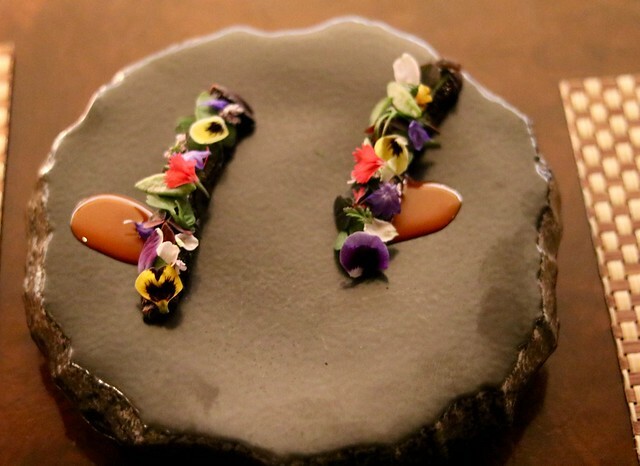 The second course was served with fossilized carrots, inspired by Leire Etxaide and the beautiful garden she kept. The carrots are prepared over a few days and soaked in calcium bath to obtain a unique texture. The vegetables are adorned with fresh herbs and gorgeous flowers on top. 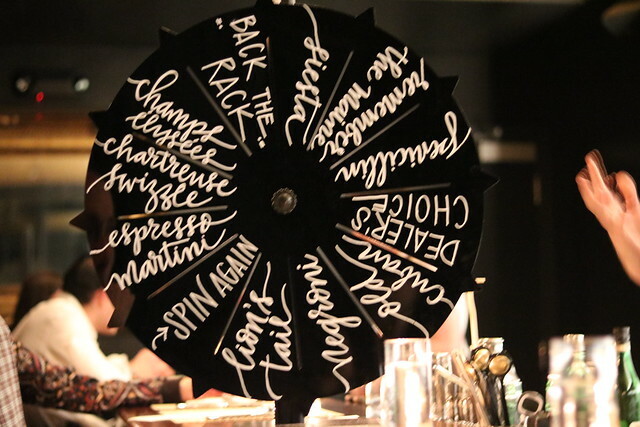 For an interactive change of pace, and an opportunity to go off course, it was time to for us to spin the wheel with speed rack roulette. 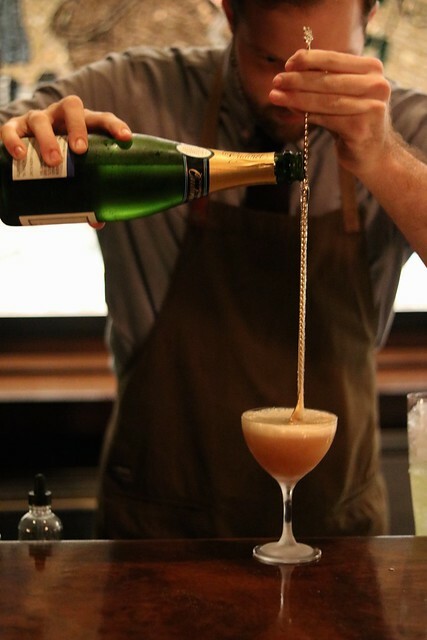 The bartenders at Columbia Room become competitive to make the cocktails landed upon as rapidly as they can without sacrificing the quality. At this point, it was safe to say we were feeling the effects our libations given the sparse nourishment. I landed on a chartreuse swizzle, a classic tiki cocktail made with chartreuse green liqueur. The bright punch-like cocktail was just what I needed to slowly wind down. Jen wound up with on an old Cuban, also created by Audrey Saunders. A master of reinventing classic cocktails, this was Saunders’ way of giving the Cuban a bubbly twist. This concoction was irresistible with champagne, aged-rum from seven countries and sugar. Dessert was spontaneously served during the third course. Licorice marshmallows dipped in Guajillo chili chocolate were presented as if they were floating. The tasting concludes with a Cuzco cocktail paired with textures of sweet Mandarin in a tangy caramelized yogurt. The Cuzco was created by Julie Reiner in 2007 after returning from a tour of pisco distilleries. The refreshing citrus cocktail calls for Pisco, Madeira, Aperol, cherry brandy, lemon and grapefruit. 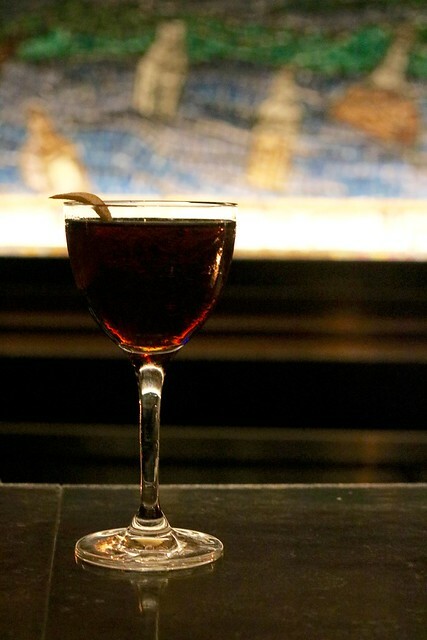 The Cuzco is an ideal libation for a nightcap to end the evening on a high note. The tasting room offers a unique experience that’s worth the price tag. We were impressed with each one of the cocktails in the curated pairing on our visit. We especially appreciated the sentiment, inspiration, and history behind each course. We recommend having dinner beforehand though, as these libations are strong!